It is no secret around here that we have made BIG changes in the products we use in our household this past year. From safer cleaning products to switching over to clean skincare, I would guess we have switched over 80% of the items in our home. And let me tell you, it feels GOOD. We still have that other 20% lingering, though, and we are in the process of switching over those final few items. Recently, we tackled one of those remaining items: switching to natural deodorant. Keep reading to find out why we decided to switch, what to expect, and my favorite products I recommend! Earlier this summer, Mike ran out of deodorant and asked me to whip out my Think Dirty app at the store and scan the options. If you don’t have this app, you NEED it in your life. I promise you will be scanning every single item with a barcode in your house! Anyway, I scanned his usual deodorant, and was shocked at how HIGH it ranked in terms of dangerous ingredients! I scanned what I had been using for years as well. And sure enough, BAD. The toxic ingredients in my antiperspirant are just BAD. So, I committed to switching to natural deodorant and ditching the antiperspirant. 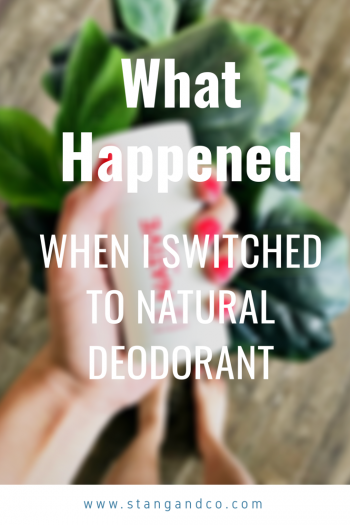 Keep reading to find out what happened and what to expect when switching to natural deodorant. I like to start off with a warning that your body WILL go through a detox period when you stop using antiperspirant. This is NOT a bad thing! Antiperspirants contain aluminum and parabens. Aluminum compounds clog your pores, which is why you stop sweating after using antiperspirant for awhile. Parabens an act as estrogen, and as a result can affect your hormone levels. Other common chemicals found in deodorant include triclosan, TEA and DEA, and artificial colors. There are links between these chemicals and cancer you guys. And it is even scarier when you think about how close deodorant is to our lymphatic system. YUCK! But with cleaning the buildup of these products up, your body will go through a detox stage. For me personally, this meant smelling some actual body odor which my antiperspirant had essentially stopped my body from producing. It may seem ideal to not have the dreaded B.O., but ultimately, it is what our bodies were made to do. And like I said, this is a detox, and within 1-2 weeks your body will regulate. To help with the detox stage, you can use a charcoal bar, which draws out oils and impurities in the skin. If I ever feel especially ‘stinky’, washing my underarms with this charcoal bar makes a HUGE difference! Bonus points, this charcoal bar is perfect for use on your face as well, so it is well worth grabbing one for use beyond detoxing to natural deodorant! One of the effects of the detox! As the aluminum that has built up in your underarms is stripped away, you will start to SWEAT again. It is interesting to experience underarm sweat when your body has been tricked into NOT SWEATING for years. But again, sweating is a natural, necessary function of the body, and manipulating it into not happening is not good for your health. Think about it; for thousands of years, people have sweated. It is how our body cools itself and maintains that perfect temperature. Our bodies are ah-mazing when you step back and think about it. This is the best part of adjusting to natural deodorant. As I said above, in 1-2 weeks your body WILL regulate. Sweating will still happen, but at a normal pace, and I have found that even during the hot summer months, I am not needing to reapply my deodorant. If I do have an especially sweaty day, one additional application has been all I need to freshen up! There are multiple natural deodorants out there, but the one I have grown to LOVE is Native Cos. 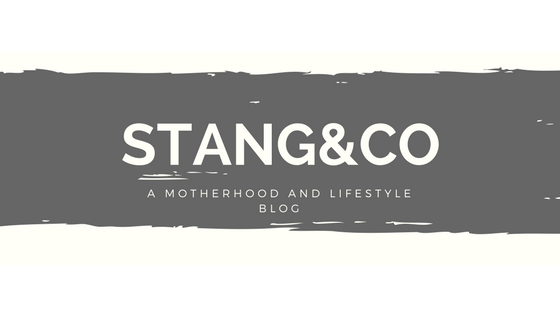 I tried out one or two other brands first, and while they were all natural, I didn’t feel like they helped to slow down sweating and cover any odor like I wanted to. All of the deodorants by Native smell SO good (my personal favorite is the strawberry rhubarb). They are constantly putting out seasonal scents, and right now they still have the summer collection in stock. Once I was sold on it for myself, I grabbed one for Mike in the citrus and herbal musk scent. I wasn’t sure how it would smell, but it is musky and slightly sweet and the perfect ‘man scent’. Ultimately, while there is an adjustment period when switching to natural deodorant, it is SO easy to do and is well worth it. We really do live in a society where we have become attributed to not questioning what we are putting on and into our bodies. Once we took a step back in our household, I cannot tell you how liberated I feel. We were using products every single day that have known carcinogens in them. Why would we continue to expose ourselves to those types of products if we don’t have to, and if there are safer alternatives that work just as well!? One of my favorite sayings I have heard is that we are the gatekeepers of our home. We get to control what we allow into it, and there are no rules stating that we NEED to use products with icky ingredients. Cleaning up products and chemicals can be done in baby steps, one item at a time! 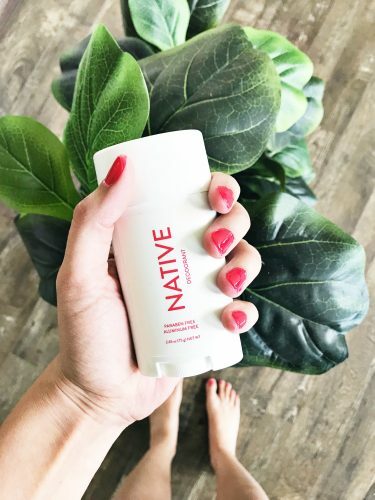 Switching to natural deodorant is one of the easiest ways to start! Have you made the switch yet? Drop a comment below and let me know how it went for you!